In case you missed it, my Europe Part I post outlined the very beginning of our European adventure in London. I’m now going to focus on the next phase of our trip when we ventured from London to Belgium and the Netherlands. 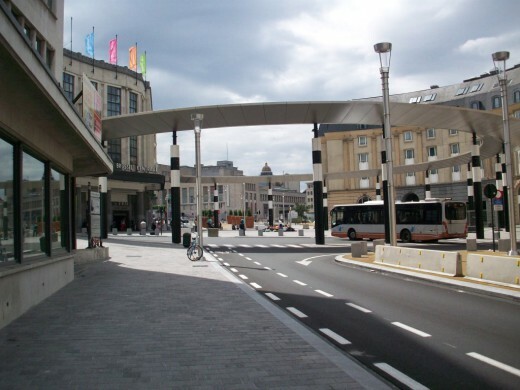 As I mentioned in my last post, we took the high-speed train from London through the Chunnel and arrived in Brussels, Belgium. Our time here was very limited and the majority of it was spent at and around the train station. 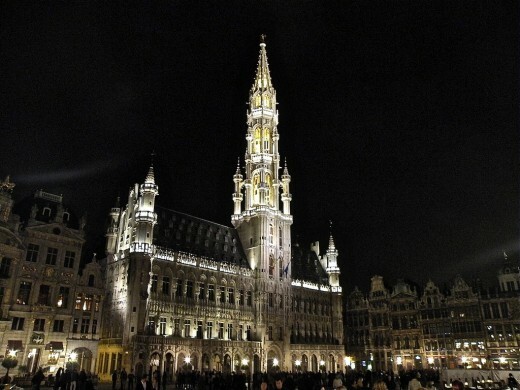 I was a little disappointed our trip plan didn’t include time to explore the city because I would have loved to see more of Brussels, including the Grand Place. But there’s always next time, right?! We walked with our large group through the train station and passed several little shops and kiosks selling souvenirs and chocolates. I’m still not sure why I didn’t stop and buy some Belgium chocolates! 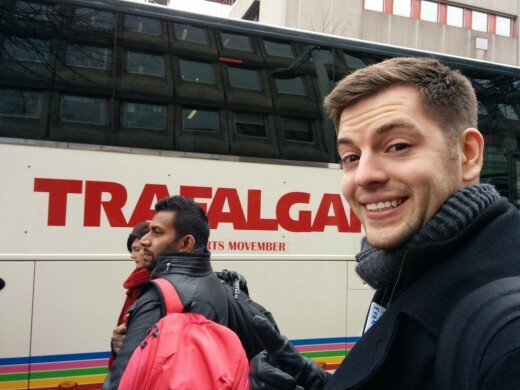 Once we got outside, we loaded up our luggage and boarded the Trafalgar coach bus. We met our bus driver and finally met our group of fellow travelers. There were people from all over the world in our group, including the United States, Canada, Australia, Malaysia, and Sri Lanka. Our travel director assigned us seats on the bus that rotated around daily. At first I thought it was a silly idea, but I surprisingly didn’t mind it. It gave us the opportunity to talk with different people in our group each day and it also switched up our view from the bus window. After everything was loaded and everyone had boarded, we began the 2 1/2 hour journey from Brussels to Amsterdam. 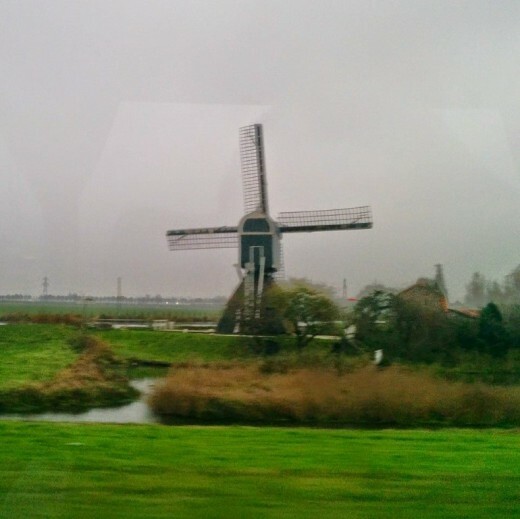 As we entered the Netherlands, we were greeted by many traditional windmills, like the one in the picture below. 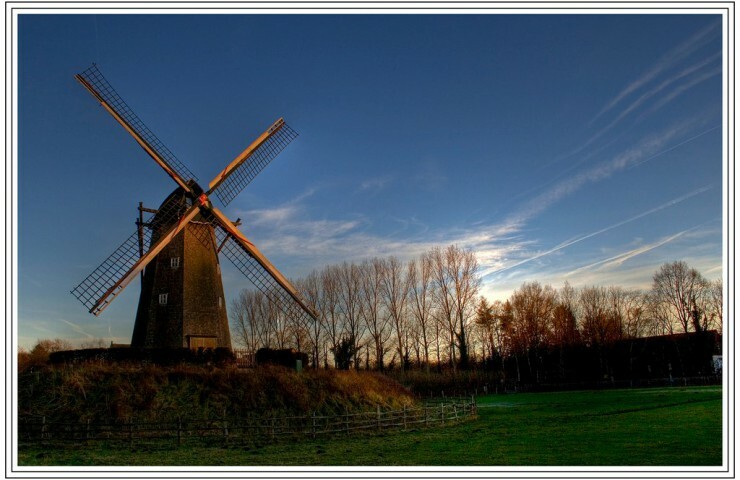 The Dutch utilized windmills and watermills to pump water out of lowlands and back into rivers to create farmland and prevent flooding. There are still over 1,000 of these windmills in the Netherlands today, and some are still being used to help with drainage. Our travel director, Emile, was actually from the Netherlands so he provided us with a lot of great knowledge, interesting facts, and stories. We learned a lot about the country and some of the history of each region we visited in Europe. If you’re considering a trip with Trafalgar, I’d highly recommend requesting Emile as your director. 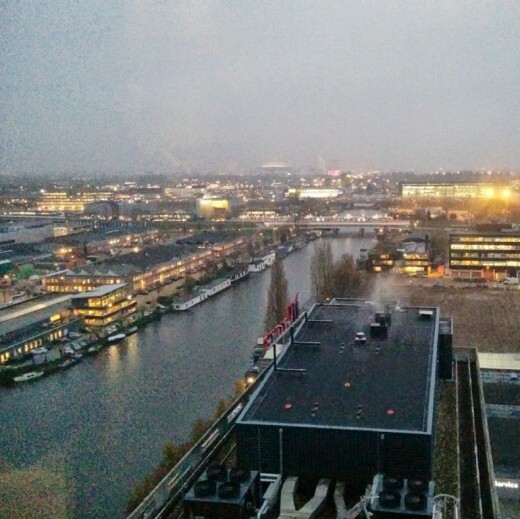 When we arrived in Amsterdam, we stopped at our hotel, the Mercure Hotel, before embarking on the night’s adventures downtown. The picture below is a view from the top floor of the hotel. 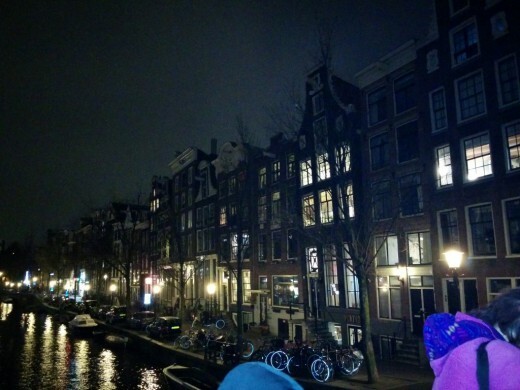 We then headed to downtown Amsterdam and had some free time to walk around and explore before our dinner cruise. 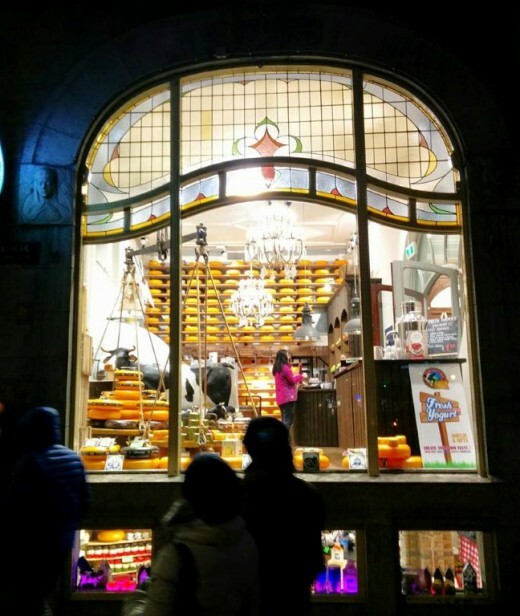 Evan and I stopped at the Old Amsterdam cheese store and sampled some cheese. We even bought a small package to take with us and eat before we left Europe. It was quite cold in Amsterdam that night, so after some brief exploring, we opted for a glass of wine a local hotel bar with some of our fellow travelers. 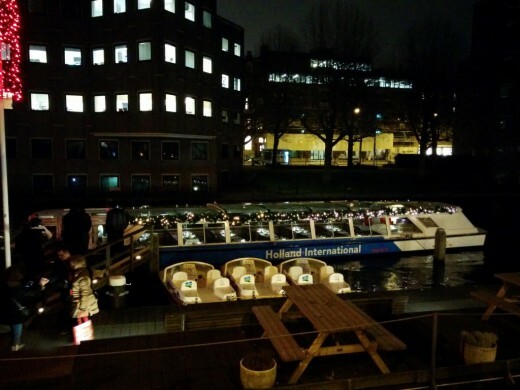 We made our way towards the canal, where we boarded a glass-topped boat for a tour of Amsterdam and our Trafalgar Welcome Dinner. Our dinner featured dishes that showcased ingredients from the 12 provinces of the Netherlands. 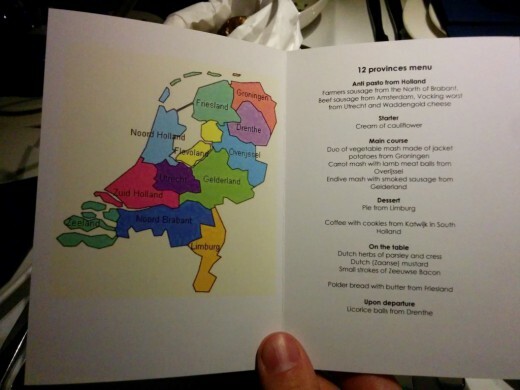 As you can see in the menu below, our appetizer was an assortment of meats and cheese from Brabant, Amsterdam, and Utrecht. We were served bread and butter from Friesland and cauliflower soup for a starter. Our main course consisted of a variety of mashed potatoes and meatballs from Groningen, Overijssel, and Gelderland. We finished with a delicious Limburg pie. 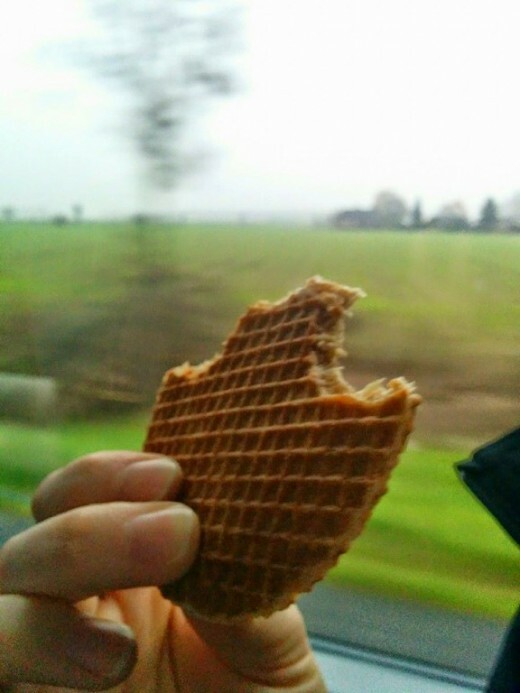 It was a great introduction to Dutch food! As we ate, we marveled at the fantastic views of the city. 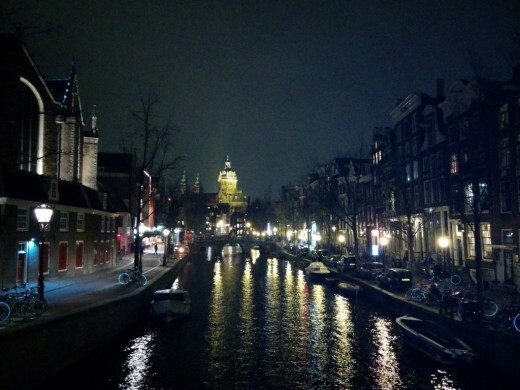 I had no idea there were so many beautiful canals in Amsterdam! 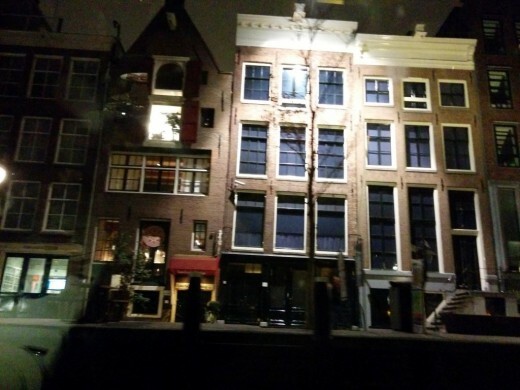 Our local guide pointed out numerous points of interest as we traveled through the canals, including Anne Frank’s house, which is shown in the picture below. Our boat tour lasted several hours and dropped us back off at our hotel at the end of the night. The tour was educational and we had a great time eating local Dutch food and viewing Amsterdam by boat at night; I’d highly recommend a similar excursion if you find yourself in the city. The drive from Amsterdam to Boppard, our first stop in Germany, was about 4 hours. If you’re already thinking we spent a lot of time traveling by bus on this trip, you aren’t wrong. We usually spent several hours a day, sometimes more, traveling to our next destination. We typically drove about 2 hours before taking a break along the motorway (it still feels weird calling it that). We learned that most rest stops in Europe charge you to use the bathroom and I found myself wishing we had converted our money before we left the States! All of the driving wasn’t bad though. Evan and I did a lot of reading on the bus (and sleeping the first few days! ), and overall, traveling by bus was a great way to see more of each country. Check back soon for the next part of our European adventure when we visited Germany and Austria!